State of Virginia, Louisa County Court. Hiram Miller son of Peggy Miller, who was born free made application in the Clerk's office of the court of said County on this 30.th day of December 1835 to be registered in pursuance of the act of the General Assembly of Virginia in that case made and provided. It is therefore certified to all whom it may concern that the said Hiram Miller is a bright mulatto man about Twenty eight years old, five feet eight inches & 3/4 high has a small scar on the left cheek and a large scar on the outer side of the right leg. No other apparent mark or scar deemed worthy of notice. 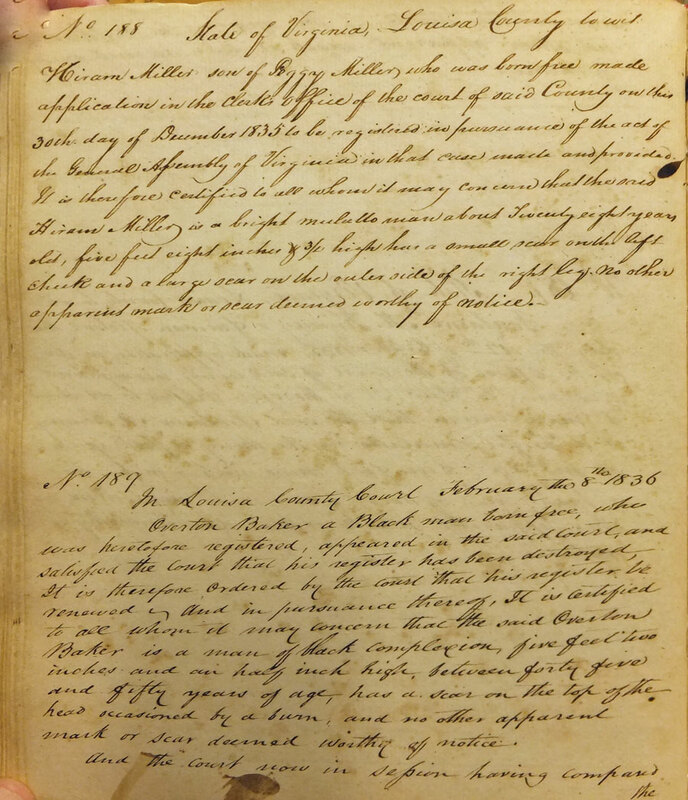 “Louisa County Free Black Register Book 1, No 188 & 189A,” Piedmont Virginia Digital History: The Land Between the Rivers , accessed April 25, 2019, http://piedmontvahistory.org/archives14/index.php/items/show/619.